Strength: Buffalo has some serious offensive weapons and tends to set them free. The Bulls were the most uptempo offense in the MAC this season, using just 17.4 seconds per possession and attacking the basket at every turn; 76 percent of their points came from inside the arc or at the free throw line. Part of that emphasis can be attributed to the presence of Justin Moss (17.9 PPG, 9.2 RPG), the 6’7” forward who won MAC Player of the Year. His ability to both run the floor and dominate on the low-block – along with a stable of talented, attacking guards like Shannon Evans (15.3 PPG, 4.7 APG) and Lamonte Bearden (8.2 PPG) – makes Bobby Hurley’s group tough to stop on that end of the court. The MAC champs are pretty solid on the other end, too, holding opponents to under a point per possession on the season. Keep an eye on Moss, though – the junior was limited during the league tournament because of an ankle injury. Weakness: Outside of its so-so perimeter shooting (34% 3FG), Buffalo does not have too many glaring weaknesses – at least not by the numbers. But that doesn’t mean there aren’t concerns. There was a three-game stretch during February in which the Bulls were bludgeoned on the defensive end, including a home loss to Toledo where the Rockets shot 86 percent from behind the arc and scored 1.3 points per possession. And for a team that shoots a healthy 72.2 percent from the stripe, Buffalo’s late-game free throw shooting in both MAC Tournament victories over the weekend was not very good. Whether these inconsistencies have to do with their youthful backcourt, lulls in energy, or something else, I’m not sure. But they can’t afford similar lapses this week. Key player: Xavier Ford (9.2 PPG, 6.4 RPG). Moss is absolutely crucial and his health should be closely monitored as the week progresses, but assuming he’s good to go, another guy to keep your eye on is Ford. The 6’7” senior’s length and athleticism gives Hurley an added dimension on the offensive end – a slasher able to get to the rim (and rebound effectively) – as well as a defender who can guard the type of athletic scorers his team will probably see next week. Outlook: Buffalo led both Kentucky and Wisconsin at halftime this season, which says a thing or two about its overall ability. As long as Moss is healthy and able to go, the Bulls are more than capable of keeping pace with West Virginia, especially considering their #12 seed line. Hurley’s bunch is talented, fiery and could end up playing on the back-half of the weekend. Strength: The Lumberjacks are the 20th-most efficient offense in college basketball – even more efficient than last year’s 32-3 unit – scoring 1.13 points per possession, boasting a sparkling effective field goal percentage (56.2% eFG) and assisting on 65 percent of made baskets. Basically, they execute their continuous-motion system to near-perfection. They even shoot 38 percent from behind the arc (41.5% 3FG in conference play), up substantially from last season (34.9% 3FG). On the defensive end, the Southland champs’ constant half-court pressure and emphasis on denying passing lanes enables them to force turnovers at the fifth-highest rate in America. 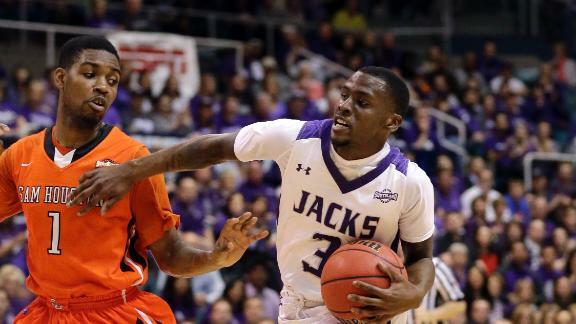 Weakness: Stephen F. Austin commits fouls at a very high rate – one of the highest rates in the country, in fact – and it showed in its only Southland loss of the season. Attack-heavy Texas A&M-Corpus Christi scored 26 of its 71 points at the free throw line (on 34 attempts), enabling the Islanders to keep pace with the Lumberjacks and eventually pull off the upset. On the season, in fact, over one quarter of all points they surrender come at the stripe. Stephen F. Austin might have problems in the NCAA Tournament if it draws an opponent keen on attacking the basket. Key player: Thomas Walkup (15.7 PPG, 6.4 RPG). The Southland Player of the Year is remarkably versatile, ranking among the top-150 players nationally in effective field goal percentage, assist rate and free throw rate, while boasting the 18th-best offensive rating (127.3 ORtg) among players who use at least 24 percent of possessions. The 6’4” forward is the team’s best rebounder, one its best passers and can defend multiple positions. And he leads the Lumberjacks in scoring. Outlook: After beating VCU in the round of 64 last season, Stephen F. Austin might be in even better shape to do some damage this year. Brad Underwood’s team is rock-solid on both ends of the floor, adept at forcing turnovers and seldom wasting offensive possessions. The Lumberjacks can roll to the Sweet Sixteen with the path ahead of it. Strength: Eastern Washington is a lethal three-point shooting team and, in turn, a lethal offense. Led by the nation’s leading scorer, Tyler Harvey (22.9 PPG), the Eagles take nearly 38 percent of all shots from behind the arc and hit them 39.6 percent of the time – the 14th best mark in the country. Four different players shoot better than 40 percent on the season, and when they get hot – like they did in the Big Sky semifinals against Sacramento State (15-of-25) – Jim Hayford’s bunch is difficult to beat. 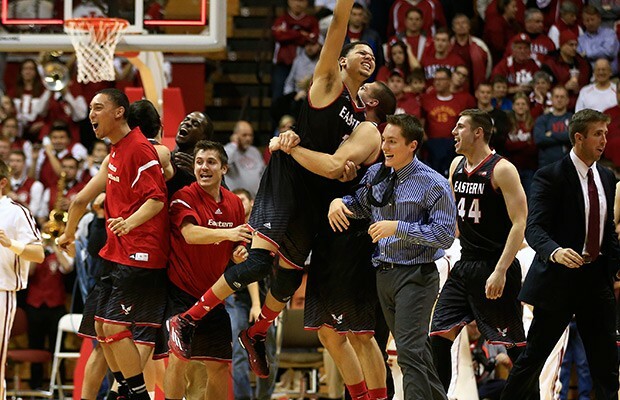 Eastern Washington also has a superb big man in 6’8” junior Venky Jois, whose offensive production in the paint and on the boards is crucial to the team’s success. Weakness: The Eagles get up and down the floor and score points in droves, but they also give up a lot of points. They rank 279th in adjusted defensive deficiency and do a very poor job of taking away the three-point line; opponents are shooting 38.4 percent from behind the arc and deriving over 30 percent of all scoring from that distance. Eastern Washington also struggles on the offensive glass (29.4% OReb), part of the reason Jois – who missed several games in the middle of the season – is so important. Key player: Venky Jois (16.6 PPG, 7.7 RPG). Harvey is Eastern Washington’s best offensive player and a true star in the making, but Jois – who does so many different things for the Big Sky champs – might be its most important component heading into next week. The Aussie big man ranks among the top-100 players nationally in effective field goal percentage (59.7% eFG), block rate and fouls drawn per 40 minutes, while serving as the Eagles’ one true interior defensive and rebounding presence. He will be vital in this week’s NCAA Tournament. Outlook: The Eagles, which snapped Indiana’s 43-game non-conference home winning streak back in November, are probably capable of knocking off Georgetown on a neutral court. They can’t afford to go cold from behind the arc, but Harvey, Jois and company have definite upset-potential against a team that has struggled in recent weeks. This entry was posted on Monday, March 16th, 2015 at 4:01 pm by Tommy Lemoine	and is filed under 2015 ncaa tournament, bracket prep. 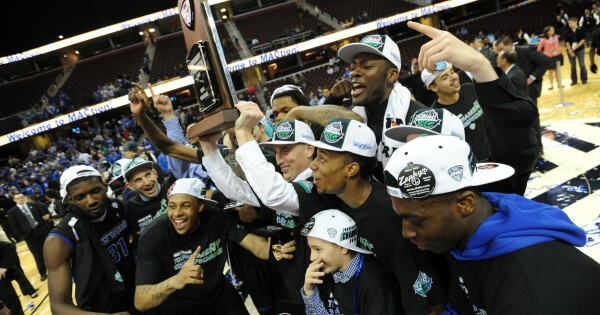 Tagged: #MACtion, big sky, big sky tournament, bobby hurley, brad underwood, buffalo, eastern washington, feature, jim hayford, mac, mac tournament, southland, stephen f austin, tyler harvey. You can follow any responses to this entry through the RSS 2.0 feed. You can leave a response, or trackback from your own site. Quick correction re: Eastern Wash that I hope doesn’t change your conclusion (I am picking them to the second weekend!). EWU plays Georgetown not Utah. Nice job on these by the way. Very helpful!